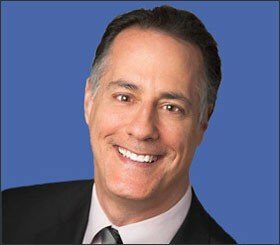 This blog post is pretty much just for me as insurance is not a very exciting topic but has great importance to all property owners, particularly companies like CWS that needs to insure nearly 100 properties in different parts of the country with unique attributes and histories and risk profiles. It’s a complicated subject and the industry is in flux so I’m following Flannery O’Connor’s approach to help work through some of the thoughts going through my head about insurance. I would categorize this as nerdy self-indulgence. The premiums paid by those buying insurance are the overt cost of insurance. For businesses covering many different types of risks, however, there is much more below the surface that can mask hidden exposures. 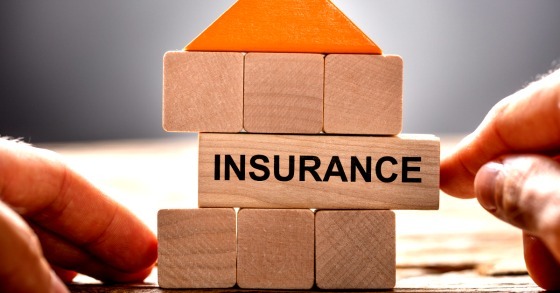 The most important of these are coverage levels in terms of aggregate coverage, per occurrence coverage, self-insurance retention, the presence of an insurance captive, and the size of deductibles for pre-specified categories of events. There is a lot more but these are some of the biggies. 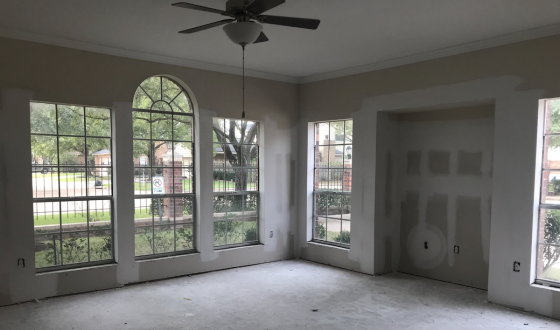 I mentioned last week that I had been in London to meet with some of our insurance carriers and some prospective ones to get a handle on the state of the market in the wake of Harvey, Irma, Maria, the California fires, and our specific account. Our London carriers cover approximately 23% of our primary layer with U.S. insurers having picked up the rest of that layer. The primary layer covers the first losses after our deductibles and self-insurance retention. Unfortunately, the $15 million primary layer was wiped out with Harvey and we have had to dip into the excess layer for the additional $12 to $15 million in claims. These excess carriers are paid relatively small premiums because the risk of them paying out claims is relatively low. 2017 proved to be one of those exceptionally painful years as they have had to pay out far more than they received in premiums. All investors have to price risk. Some do so consciously and others unknowingly because they do not think comprehensively about what can go wrong. The one type of business that has to think comprehensively about risk is insurance because that is why it exists. This is one of the key reasons why Warren Buffett has been such a phenomenal investor. He thinks far more comprehensively about risk than most investors. And having a massive portfolio of insurance companies has enabled him to sharpen his skills over the years in terms of pricing risk for all types of businesses. When I buy insurance I am transferring risk to the company. I am relying on their financial strength and willingness to adhere to the terms of our agreement in the event I experience an insured loss. Insurance is available for just about any risk you can imagine. It is up to insurance companies to quantify the frequency and severity of the risks they cover. Historically, large earthquakes are relatively rare but when they do happen they can be quite severe in terms of the damage they cause. Automobile accidents are quite frequent but, generally speaking, not very severe on average. Unfortunately for insurers, the apartment industry has not been profitable due to numerous fires and significant losses in Colorado and Texas from massive wind and hail damage destroying roofs in large numbers. Add to this Harvey, Irma, and Maria, and the losses have exploded. And now it appears they are looking to recoup these losses via higher premiums and more risk retention among those they are insuring. More on this in a bit. One of the key reasons the housing bubble became so massive and subsequently cratered was because investors mispriced risk. They looked in the rearview mirror and concluded that since housing prices never dropped they would continue to go up. Knowing this convinced lenders and investors in mortgage securitizations to aggressively seek to deploy capital in the industry and fuel borrowers to purchase and refinance homes with increasingly more aggressive lending standards, or lack thereof. This created more buying power which served to push prices higher which made investors more confident to allocate more capital in the industry. This served to only inflate the bubble even more. Something finally gave as cracks began to appear and mortgage defaults started to rise and then quite significantly. Investors realized the emperor had no clothes and the greatest economic calamity since the Great Depression ensued. The true risks materialized and trillions of dollars of wealth evaporated throughout the world when investors headed for the exits and this rippled through to the real economy via massive job losses, foreclosures, income contraction, and spending reductions. This is a powerful example of how poor modeling can lead to terrible consequences. While I will not put insurers in the same category as mortgage investors, although AIG needed a huge bailout due to its activities in this area, during these meetings it became clear that insurers have been underpricing risk in many areas, but particularly for multi-family coverage. Rates have dropped for 16 consecutive quarters and have fallen for 10 years and dropped 30 to 40% from peak to trough. Losses and expenses are close to breakeven before losses attributable to what they are calling H.I.M. H.I.M stands for Harvey, Irma, and Maria. Even Berkshire Hathaway is losing money in its insurance operations for the first time in many years. But don’t fret for Warren buffet because his conglomerate is so well diversified that many other businesses are making up for the rare insurance losses. The underlying loss ratio for the third quarter of this year was 68.4%, a 1.4 point improvement over last year’s 69.8%. On a year-to-date basis, the GAAP combined ratio was 113.9, was again nearly 17 points of cat included in this result. The year-to-date attritional combined ratio for the global insurance operation is producing 96.5%, which also compares favorably to the 97.1% for the comparable period in 2016. The first number represents what percentage of premiums are paid out in non-catastrophe losses without factoring in expenses. The combined ratio factors in expenses and catastrophic losses which at nearly 114 shows that the company paid out $1.14 of losses for every $1 dollar of premium received. This excludes investment results. The attritional combined ratio backs out catastrophic claims. I could sense in our meetings that investors and management teams have had enough and they were not going to write business that has a high probability of generating a loss. There was a palpable sense of fear that people’s jobs were on the line if they lose money over the next couple of years. The CWS account has been a challenge and somewhat perplexing for our carriers given we have great operations and assets. 90% of our properties have fire sprinklers, high average rents, which usually means less per capita smoking, and a great safety and risk management program. And yet mother nature took a very heavy toll via major hail storms in Dallas/Fort Worth causing roof destruction at multiple properties and Harvey wreaking havoc in Houston. The net result was big losses being generated for our carriers, some of whom have been with us since 2010 and have experienced a cumulative loss during that time given the big claims in 2017. I used the analogy in the meetings that our situation is akin to playing poker. Our carriers are betting correctly relative to the hands they have been dealt and the information they can discern from the other players. Despite the odds being in their favor, they have still lost. The best poker players believe it is better to bet correctly and still lose versus winning when betting incorrectly because the latter is not sustainable and will reverse and so will the former. Unlike poker, however, where the probabilities are probably more quantifiable and accurate, it’s very possible that their risk models may no longer be accurate, akin to mortgage investors during the subprime boom betting on ever-rising home prices, and they have to recalibrate them for climate change and growing populations in flood-prone areas. This is weighing on my mind as a multi-family investor as well and something we need to think more deeply about at CWS. It’s clear that Texas government officials are thinking about this as well as the following headline shows. 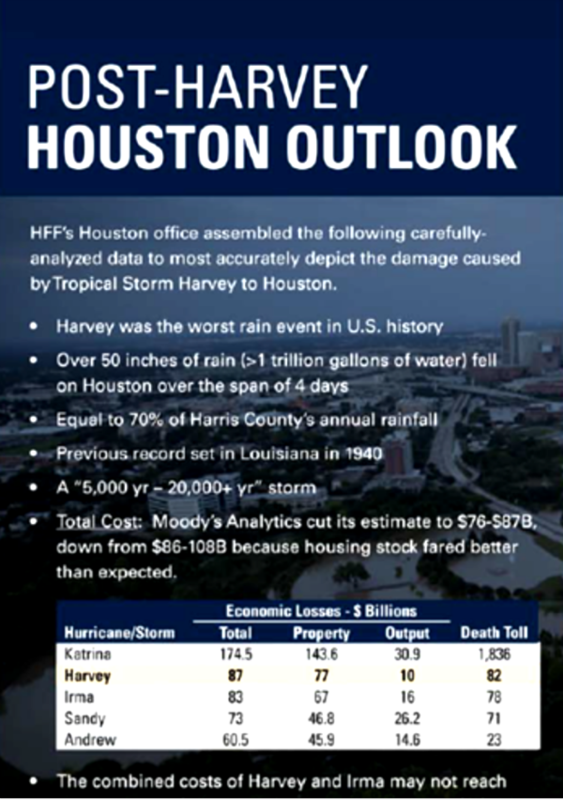 If you read the article, you will learn that much of the funding is targeted to the Houston area and state officials believe the loss is closer to $180 billion, much larger than what HFF (via Moody’s) is estimating. Either way, the losses are enormous. Returning to the poker analogy, from CWS’ perspective we played our hand relatively well as we structured our insurance coverage in very effective ways such that nearly all of the risk we were exposed to had been transferred away. Going forward, however, we have to anticipate that the risk sharing will fall back more to us. We want our insurance carriers to make money off our account so that they will be with us through all aspects of the cycle. We want our important partners to be financially healthy and to have a profitable relationship with us. As a result, we in no way feel a sense of glee or gloating with their losses. We would much rather have had none of this happened and the carriers making a reasonable return from our account. 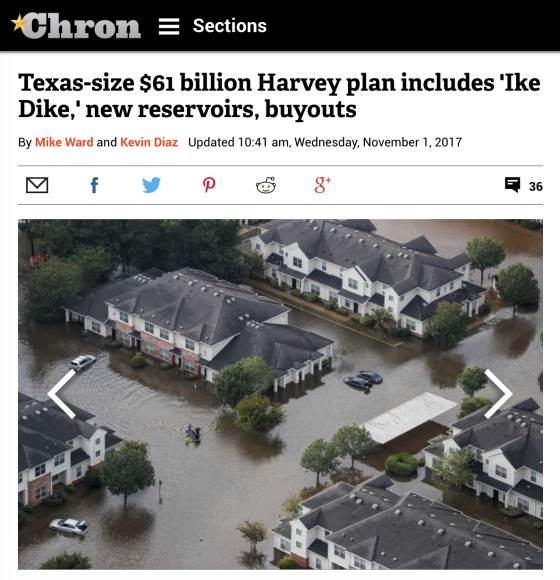 On the other hand, this is why we have purchased insurance and our carriers stepped up immediately to help us fund and support our clean up, remediation and rebuilding. We are so grateful for how they have been there for us and this is something we will not forget. Each carrier asked us if we were happy with how they handled the claims from Harvey and they truly took pride in knowing we couldn’t have been happier. They all said that is why their clients buy insurance and they have an obligation to be there for them during their times of need. That was very gratifying to hear from each and every incumbent carrier. I’m sure this is more than you cared to learn about insurance if you have continued reading this far but it has been helpful for me to get my thoughts and concerns out. I will end the post with a remark by an executive at Swiss Re, one of the world’s largest reinsurers, during their recent earnings conference call. He sums up pretty much what I heard during our meetings in London. Prices have to rise for insurance as returns on capital have been too low and they expect premiums to rise. So it’s pretty clear that this is now the time where prices have to return to sustainable levels. Obviously, these expected increases they vary, firstly depending on how loss affected certain businesses are, but then also how much the price deficiency was on the expiring accounts. So in broader terms, I would say, clearly, most significant increases are expected in U.S., as this is the market most effective, but of course also in the Caribbean and turn a bit to further away, we would expect more moderate price increases, but pretty much a global impact. It will be interesting to see if the expected firming of prices takes hold. There is still a lot of capital available to cover insurance risks. The question is whether the pricing discipline will be there. Interestingly, the stock price of reinsurers are definitely off their lows but still about 5% or so from their highs. It’s not atypical for them to do quite well in the aftermath of big industry losses as investors start pricing in big premium increases. That does not appear to be the case at this moment in time. From a CWS perspective, we shall have more visibility over the next few months. How has the CWS captive (I’m assuming there is one) fared in all this?